This week’s guests on the weekly ‘All Things Autism‘ was Steven Smith and Jo Wiggins Annand. This was Anna Kennedy’s special birthday show where they talked about the work of their charity Anna Kennedy Online (AKO). Jo Wiggins Annand is a Charity Champion and after Jo’s son Ryan took part in Autism’s Got Talent in 2014, she quickly became very aware of how much AKO helped people, and started helping out at various events and loved seeing the joy these experiences brought to people. Jo shares: ‘I had a lovely time yesterday at the Woman’s Radio station; very welcoming staff and lovely to chat with Anna and Steven. I enjoyed talking about one of my favourite projects with AKO – our first album launch at The Hard Rock Cafe. ‘I was getting goosebumps talking about it as it is such a fond memory. We also talked about how important free time for parents and carers is and our upcoming expo, but the subject closest to my heart that we touched on is bullying. I have so much to say on the subject having sadly had to experience it with my son Ryan and to be honest I could’ve gone on for longer. Ryan’s anti-bullying video, which he created in 2015, went viral during Anti Bullying week. Meanwhile, Steven Smith has now been one of AKO’s patrons for five years. Steven shares: ‘It has been a pleasure and an honour to be a patron of AKO. My journey started a little differently with Anna and the many wonderful volunteers and other patrons. Unlike most patrons, I do not have a family member on the autism spectrum. ‘I hope, however, that my enthusiasm and passion ensured that my commitment was apparent and that I had as positive impact as those with direct family experience of the condition. ‘It was only by chance that my path crossed Anna’s. My dear friend, Samantha Tomlin, and I worked on a diversity project together. Samantha’s son is on the autism spectrum and after we spoke about the beneficial work Anna Kennedy does, Samantha offered to introduce me. ‘With my 35 years of experience in the beauty and fashion industry, I was asked to judge ‘Wear It for Autism”, hosted by Anna. It sounded simple enough – picking winners for an amazing makeover, something I had done on GMTV and for many magazines. Boy was I wrong! The stories of bullying and of overcoming challenges, as you can imagine, left me in tears. I also was privileged to hear Anna’s own life story and can only describe her and her work as super human. Charities play an active role in raising awareness about autism. ‘It important for most charities to have people who can spread the word. I dedicate myself to being proactive in doing just that. You do not have to have direct experience of living with or supporting someone with a disability or serious health condition to identify with charities that support such people. I can attest to this. 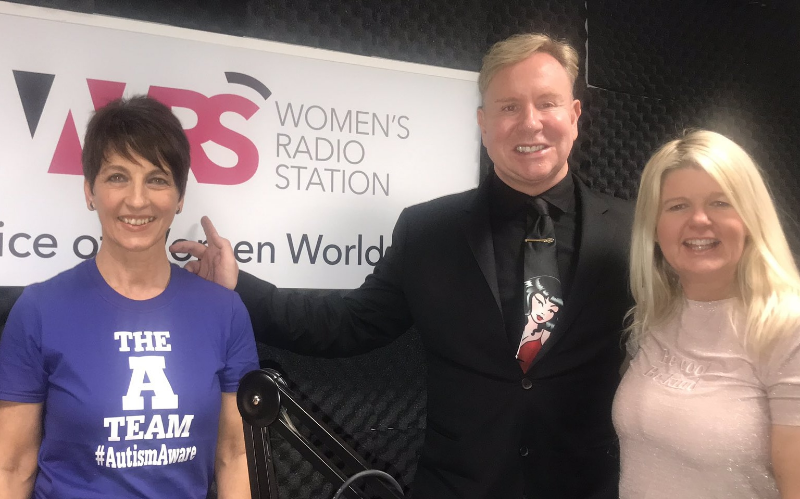 You can listen to Anna and her guests on Women’s Radio Station at 1pm every day.